No one embodies the American dream more vividly than Luminita Cirstea. She is a living testimony to the fact that, in this country, if given a chance and if talented and determined enough (two big if’s), you can become what you want to be. 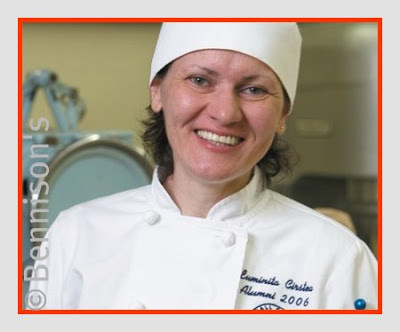 Born in the small city of Vilcea-Dragasani in Romania to a history teacher and a landscape designer, Lumi always dreamed of working in the food industry. But her parents believed that a career as a baker would be a surefire ticket to long hours and low pay. So she became a telecommunications engineer in Sibiu, a medieval town in Transylvania. The years passed. She excelled at what she was doing, was sent abroad for further training, and even got promoted, but her heart wasn’t in her career. Each evening she had to set three alarm clocks to make sure she would wake up in the morning, and every morning she had to drag herself out of bed. The dream hadn’t died, however. Only now it was focused on relocating to the United States, a country where she was convinced it could come true. So, seven years in a row, she tried her luck at the annual Green Card Lottery and in 2001, she hit the jackpot. She won permanent residency and was given one month to wrap up her life in Romania and move to the US. Lumi said her goodbyes and bought a one-way ticket to Chicago. Why Chicago? When interviewed for her visa by a staff member at the American Consulate, she was asked to choose a port of entry. Her interviewer was from Chicago and told her it was a beautiful city. She picked Chicago. Her mom had helped her to pack four enormous suitcases. By the time she was done with the formalities and issued her papers, these four cases were the only ones left on the carousel in the baggage claim area. Nobody was in sight, and she could not read the instructions on how to get a luggage cart. Since she couldn’t possibly carry all of her bags, she picked two at random, removed the tags from the other ones, and left them behind. It was a heartbreak and to this day, she hasn’t had the courage to tell her mother. The taxi driver took $100 to drive her and her two suitcases to a nearby motel where she stayed until she found her first job. Her telecom experience was of no value since the technologies she had learned in Romania had long ago become obsolete in the US. Through an agency that primarily placed immigrants, she was hired by a wealthy family in the suburbs of Chicago as a live-in dog sitter and housekeeper. In exchange for room and board and a modest stipend, she walked the dogs, prepared their meals, and cleaned the house. Knowing that she needed to learn English, she asked her employer to help her arrange for lessons which she would pay for out of her own pocket. After a while, she was ready to find a new job where she could practice her English. She was hired for the holiday season at Piron Belgian Chocolatier, and afterwards worked at a variety of jobs that ranged from waitress to veterinary assistant. She continued to improve her English, attending free ESL (English as a second language) classes at night at a local high school. Once she knew enough English to get by, she enrolled in evening classes in grammar, punctuation and speech at a local community college. She became an American citizen on April 18, 2006, one of the “proudest days of [her] life”. The next step was to get into culinary school. She applied to and was accepted by the School of Culinary Arts at Kendall College in Chicago. In her mind, food was love and she wanted to make people happy through the dishes she would create. To support herself while in school, she worked full time in a seafood company where she had secured a sales job. She also received from Les Dames d’Escoffier of Chicago a generous fellowship which helped pay her tuition. One of the requirements for the year-long program in Professional Cookery was to take a Baking & Pastry class. That class changed her life forever. 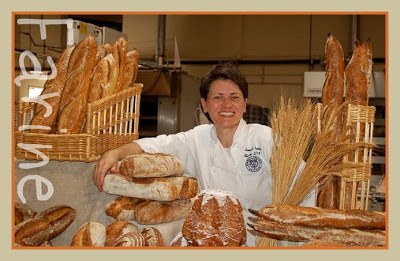 She decided to continue her education for two more years by working towards an Associate’s Degree in Baking & Pastry and discovered in Chef Melina Kelson-Podolsky’s class that her greatest passion was making artisan bread. 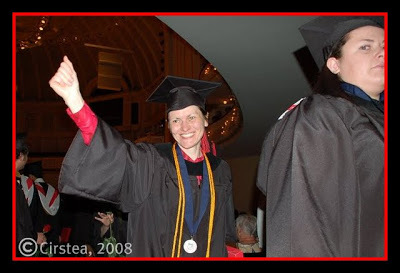 After graduation, Lumi worked at Bennison’s Bakery in Evanston, Illinois where she had earlier completed an internship. She learned to move fast and to be “a dough doctor” (when dough isn’t behaving as expected in a bakery, there is no time to google the issue or peruse through a book). She learned a lot from the owner of the bakery, Jory Downer, winner of the Gold Cup at the Coupe du Monde de la Boulangerie (Bread World Cup) in 2005, as well as from his hard-working and talented team. 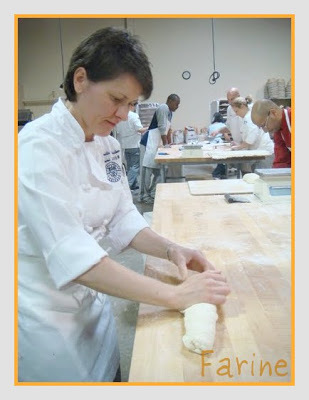 Chef Downer recommended that she become a Certified Journey Baker. She passed the test in 2008. Always ready to challenge herself, she went one step further the next year and took another exam (both written and hands-on) to become a Certified Baker. Again, she passed. 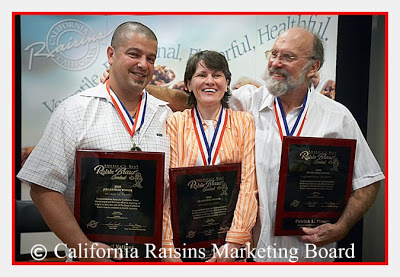 Meanwhile, in 2008, Lumi competed in the first ever California Raisin Bread Contest with a rye/raisin formula she had spent two months perfecting while working at Bennison’s. The California Raisin Board awarded all of the winners a tour of California raisin country, various vineyards in the Napa Valley, Yosemite National Park, and the San Francisco Bay area in late March 2009. By that time Lumi had left Benisson’s where she had been working full-time since her graduation. She had decided to do some “graduate work” in baking & pastry by taking classes with such master bakers as Didier Rosada and Jeff Hamelman as well as by attending workshops with Paco Torreblanco as well as with Stephan Glacier (with whom she will perfect the making of French macaroons this coming October). She also traveled to work in bakeries under the excellent supervision of Tim Foley at the Bit of Swiss in Michigan and Solveig Tofte at the Turtle Bakery in Minneapolis. Never shy of learning something new, she helped build a brick-oven at Kendall College (for pictures of this experience, click here). Earlier this year, Lumi also signed up for the “Draft”, a two-day hands-on workshop for bakers hoping to participate in the next Coupe du Monde. She created and then painstakingly tested formulas for six different breads for nearly four months. 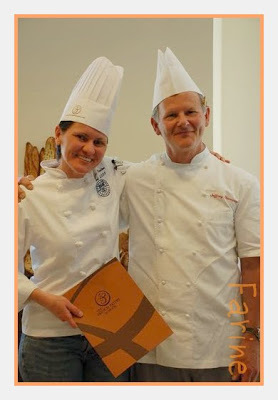 At the workshop which took place at the San Francisco Culinary Institute in June, she met “fabulous bakers”, such as John Tredgold (aka J.T.) from Semifreddi’s, Ben Hershberger from the Phoenician, and Matt McDonald from Bouchon Bakery to mention only a few. Working alongside “these stars of the American baking world”, Lumi felt she was once again living a dream. 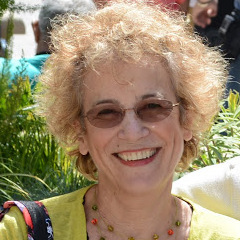 I had the good fortune to meet Lumi last spring at SFBI’s Whole Grains Workshop with Didier Rosada. We met again this summer at Artisan III, again with Didier Rosada. True to what her name evokes (“lumen” means “light” in Latin), Lumi has a glow about her. 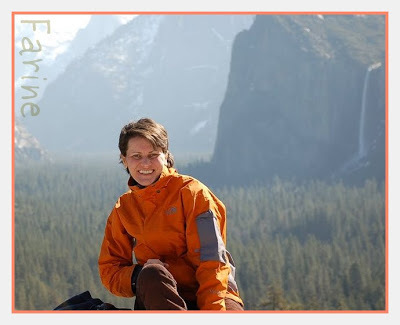 She radiates warmth and generosity and when you hear her story, you can’t help being awed and deeply moved. So let’s give her a solid round of applause and wish her the very best! Lumi, we are honored that you chose to come and live in this country. Lovely post, indeed a moving story… bread can really be a passion! Thank you very much for letting us know about Lumi's achievements. Thank you also for the link to her winning recipe. I find the 90 min. rest in step 2 a surprise to me, not that I've made many rye breads. I want to try the recipe. But first, stupid question time – the liquid levain would be mixed the night before and set out at room temperature? The recipe specifies the raisin preparation, but not the levain. Hello, Esther, and thanks for stopping by! I emailed your questions to Lumi and will post her replies as soon as I get them. Stay tuned! "The liquid levain is made the day before. Twelve hours at room temperature will be OK. The first fermentation is done without the raisins and the salt percentage is low. The second fermentation happens after the raisins are added. 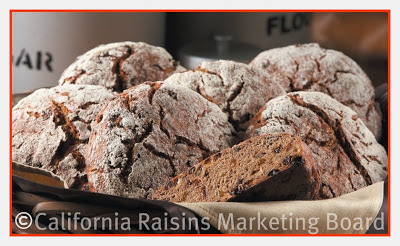 Since the raisins have a high sugar content, I add an extra percentage of salt to balance the fermentation. Finally, the last fermentation happens in the proofing baskets when the dough relaxes and this fermentation occurs at a normal rate. Good luck to your reader. I hope he or she can make a good, tasty loaf. (Rye is very hard to handle sometimes, but when you practice, you start to love it.) If there are any more questions, I'd be happy to try to answer them." Thank you so very, very much! I really appreciate this! I will let you know how it turns out. Thanks for the update from Lumi about the fermentation time for her winning raisin rye bread recipes. Très bel article sur un petit bout de femme hors du commun !! Quelle personnalité ! Et quel exemple à suivre en matière de détermination et de courage. Je tire mon chapeau. C'est un très bel article et un très beau sujet. Bravo ! Thank you, Farine and Ms. Cirstea, for sharing Ms. Cirstea's beautiful story of achievement. I tried making Ms. Cirstea's raisin-rye bread and we absolutely love it. It's absolutely delicious!!! With gratitude! Thank you, Anonymous! I will let Lumi know… She'll be so pleased. I read your story about artisans and happy to see one of them is Romanian, like me…and her name is the same as my wife's name, Luminita ! Thanks God for such Romanians who made us feel so proud and thank you MC for sharing with us such stories and recipes. Hello Laur Barbu, thank you for your comment to Lumi. I will forward it to Lumi. Hello iulian, welcome to Farine! What a lovely name Lumi and your wife have in common. I will convey your comment to "my" Lumi. She is such a wonderful person and baker. I go to Johnson and Wales in Providence. 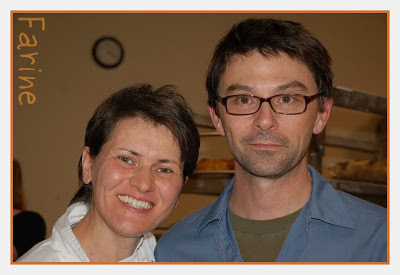 Chef Lumi is my Intro to Baking teacher and it is a fun and amazing experience working with her. She is very strict and loves bread to no end (she says if asked her favorite color it would be bread). She has a thick thick thick Romanian accent and is really funny. Hi, I would very much like to contact Luminita. Would it be possible to obtain her email address? I am a pastry chef looking to lean more about brea and your website is so amazing! I am romanian as well and as Luminita left my life in Romania to move to London and become a pastry chef. Now I feel i want to come back home and share my knowledge. I wanted to ask her for some advice that is why I would really like to write to hwr personally.